For most auto enthusiasts, pulling the tarp off an old unseen car is a rare delicacy, but for Dan Stafford, it’s a way of life. Stafford runs Dan’s Garage in Kennewick, Washington, which specializes in GM performance cars from the ‘40s all the way up to the ‘80s. He got a call recently from a family in Las Vegas looking to offload some of their father’s old rides. 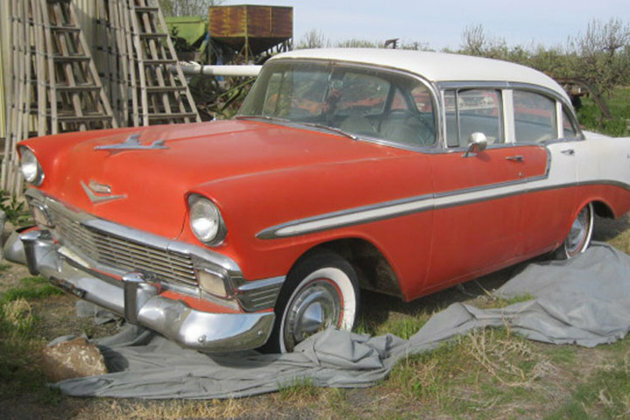 The father, from Wapato, Washington, passed away several months earlier and left behind a pair of ’68 and ’69 Camaros, a ’56 Bel Air sedan, ’61 Ford Econoline Pickup, and a burly ’77 Dodge Ramcharger with a 440ci engine. But instead of finding the old wheels cooped up in a barn or left high and dry on blocks in the yard; these were carefully cared for and stored underneath tarps behind the family’s orchard. Stafford said it’s the kind of phone call that you dream about if you’re in the business. 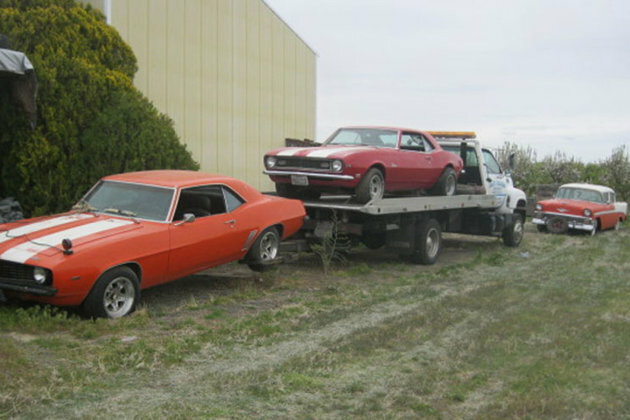 After the family located the original paperwork, he made the deal and the cars have found a new home in Kennewick. The ’68 Camaro comes fitted with its original V8, automatic transmission, power steering, and air conditioning. The orange ’69 also sports the V8, auto box, and power steering, but lacks the A/C unit. The ’56 Bel Air contains a 265ci V8 and power glide automatic, with a redone black on white interior. The Ramcharger and Econoline are bit rougher on the outside, but both contain original engines, with the Dodge packing loads of factory extras. The cars will nestle in next to the Impalas, Firebirds, Monte Carlos, and other performance autos located on Stafford’s 3.5-acre lot, waiting patiently for their second life.